The influence of synthetic and natural porphyrins bismuth complexes on P. aeruginosa quorum sensing system was carried out by detec­tion of the pyocyanin, rhamnolipids and autoinducers biosynthesis level. The highest ability to reduce pyocyanin biosynthesis showed Bi(III)-TPP. Rhamnolipids production level also decreased in the presence of studied compounds. This effect was the most expressed in presence of 40 and 80 μM of the synthetic meso-substituted porphyrins. Autoinducers biosynthesis, especially 3-oxo-C12-HSL was sup­pressed in presence of the bismuth complexes. That suggest that the mechanisms of action of this substances is an inhibition of signaling molecules or/and receptor for them. Today in connection with the high resistance of opportunistic pathogens such as Pseudomonas aerugi­nosa, Staphylococcus aureus, Escherichia coli, etc. to tra­ditional antimicrobial drugs, infections that are caused by these bacteria gain high prevalence, especially in patients with various immune deficiencies. Thus, one of the future tasks of modern pharmacology is the search for new antibacterial drugs, which may have inhibi­tory activity against pathogenic bacteria, especially with non-traditional mechanisms of action. One of the most promising groups of new antimicrobial agents may be compounds that break down bacterial cell-cell signaling pathways (Kociolek, 2009 ). Intercellular signaling pathway, known as quorum sensing is a global regulatory mechanism based on the use of small signaling molecules that play a rolein gene expression in a bacterial cell population (Bassler, 2002; Brown et al., 2001). This mechanism is the basis of many bacterial cell properties such as pathogenicity, and biosynthesis of secondary metabo­lites. Consequently, studies focused on the regulation of this system, seem to be of promise in biotechnology and medicine. A quorum sensing system from P. aeruginosa (for­mally an autoinduction system) is based on three fami­lies of genes – las-, rhl– and pqs-. Each of these families activates with its own signal molecules: 3-oxo-dodeca­noil-homoserine lacton (for las– family), butiryl homo­serine lacton (for rhl– family) and 2-heptyl-3-hydroxy-4-quinolon (for pqs– family) (McKnight et al., 2000). P. aeruginosa quorum sensing system works based on the binding of signal molecules with specific cytoplasm receptors and “signaling molecules-receptor” complexes formation. These complexes activate the expression of target genes (Winzer and Williams, 2001). Previously, we demonstrated that synthetic por­phyrins and their complexes with metals can possess antimicrobial activity; in particular inhibit bacterial biofilm formation (Galkin et al., 2010). In this study we investigated P. aeruginosa PA01 quorum sensing sys­tem functions in the presence of synthetic and natural porphyrins bismuth complexes. Bacterial strains and growth conditions. P. aeruginosa PA01 were obtained from the collection of the microbiology, virology and biotechnology department of Odessa National University named after I.I. Mechnikov. Bacterial strains were grown on the meat-peptone agar (MPA) and Gis media. For pyocyanin detection, bacterial were strains grown on the PB broth (g/l, pep­tone – 20; MgCl2 – 1.4; K2SO4 – 10). Chemicals. Synthetic and natural porphyrins bis­muth complexes – meso-tetra(4-N-methyl-piridyl)por-phyrin bismuth complex (Bi(III)-TPP), meso-tetra(6-N-methyl-quinolinil)porphyrin bismuth complex(Bi(III)-TQP) and protoporphyrine IX bismuth com­plex (Bi(III)-PP IX) were synthesized by method (Ishkov et al., 2000) in PLMS-5 of Odessa National University named after I.I. Mechnikov (Fig. 1). 3-oxo-dodecanoyl-homoserine lactone (3-oxo-С12-HSL) and butiryl homoserine lactone (С4-HSL) stand­ards were obtained from Sigma Aldrich. 2-heptyl-3-hydroxy-4-quinolon (PQS) was synthe­sized by the method of Somanathan and Smith (1981) in PLMS-5 of Odessa National University named after I.I. Mechnikov. Cells pre-incubation with discovered compounds. To study the production of pyocyanin and ramnolip­ids bacterial (2 × 108 CFU/ml) cells were pre-incubated with the test substances in concentrations 0.4; 40 and 80 μM in saline buffer for 1.5 h at 37°C. Pyocyanin production study. After incubation with porphypins bismuth complexes bacterial cells were washed three times and inoculated to 5 ml of PB broth. Bacterial cells in PB broth were incubated overnight at 37°C. After incubation bacterial cells were removed by centrifugation at 6000 × g for 10 minutes. Pyocyanin from supernatant were extracted and measured by the methods of Essar et al. (1990). A 5 ml of culture super­natant were extracted with 3 ml of chloroform. Chlo­roform layer were transferred to a fresh tubes and re-extracted with 1 ml of 0.2 N HCl. After centrifugation, the top layer was collected and its absorption at 520 nm was measured on μQuant (Bio-Rad) spectrophotometer. Rhamnolipids production study. For rhamnoli-pids production study bacterial cells were inoculated to 10 ml of Gis media and were incubated overnight at 37°C. After incubation bacterial cells were removed by centrifugation at 6000 × g for 10 minutes and superna­tant were concentrated as follows. The pH of 10 ml of the culture supernatant was adjusted to 6.5, and ZnCl2 was added to a final concentration of 75 mM (Guerra-Santos et al., 1984). The precipitated material was dissolved in 10 ml of 0.1 M sodium phosphate buffer (pH 6.5) and extracted twice with an equal volume of diethyl ether. The pooled organic phases were evaporated to dryness, and the pellets were dissolved in 500 μl of methanol. The total amount of rhamnolipids was determined using the orcinol assay (Candrasekaran and Bemiller, 1980): 500 μl of the rhamnolipids samples were mixed with 500 μl of an orcinol reagent (0.2 g orcinol, 0.1 g FeCl3 in 100 ml of the 30% HCl). After heating for 20 minutes at 100°C, the samples were cooled for 15 min at room temperature and the OD670 was meas­ured on μQuant (Bio-Rad) spectrophotometer. Autoinducers production study. Level of homoser­ine lactones synthesis was measured by gas chromatog­raphy/mass spectrometry method (Pearson et al., 1995). Homoserine lactones were extracted from a cul­ture supernatant by ethyl acetate. Organic phase were collected and evaporated to dryness. The pellets were diluted in methanol and purified by HPLC on the C18 reverse phases columns in methanol-water gradient. Gas chromatography/mass spectra were carried out on Hewlett-Packard 5890 with Hewlett-Packard Ultra-1 capillary column (25 m × 0.2 mm with film thickness of 0.33 μm). Helium as a carrier gas was used. Tem­perature gradient was at 70 to 240°C with increment by 10°C per minute. Mass spectra were collected by ZAB-HF mass spectrometer (VG Analytical, Manches­ter, UK) with homoserine lactones standards. PQS level from culture supernatant was determined by the method of Deziel et al. (2004). Ethyl acetate extracts were separated by TLC in dichlormethane-acetonitryl-dioxane mixture (17:2:1) with PQS stand­ards. PQS dotes placement was identified by UV. PQS dots were eluted from TLC plates (ALUGRAM® SIL G/UV254) with ethyl acetate and luminescence of elutes were measured with LUMISTAT at 312 nm. All experiments were carried out three times. The influence of synthetic and natural porphyrins bismuth complexes on P. aeruginosa quorum sensing system was carried out by detection of the pyocyanin, rhamnolipids and autoinducers biosynthesis level. For these studies bacterial cells were pre-incubated with several concentrations of the synthetic and natural porphyrins bismuth complexes (0.4; 40 and 80 μM). This was done to neutralize the inhibitory activity of used concentrations, which has been shown previously (Galkin et al., 2010). The study of the biosynthesis of pyocyanin showed that level of this pigment in supernatant of the P. aeruginosa PA01 overnight culture decreased in the presence of all concentrations of the compounds studied (Table I). Determination of the basic pigment level in culture supernatant showed that P. aeruginosa PA01 synthesize 6.31 μg per ml of pyocyanin after overnight incubation. After treatment with a 0.4 μM of each compounds the pyocyanin level decreased by a 10%. When higher concentrations were used, the difference in the activ­ity of the studied compounds been observed. After pre-treatment with 40 μM of the Ві(ІІІ)-ТPP, pyocya­nin level decreased by a 38%; Ві(ІІІ)-ТQP – 30% and Ві(ІІІ)-PP IX – 18%. Maximal anti-pyocyanin activity was observed after pre-treatment of P. aeruginosa PA01 with an 80 μM of studied compounds. 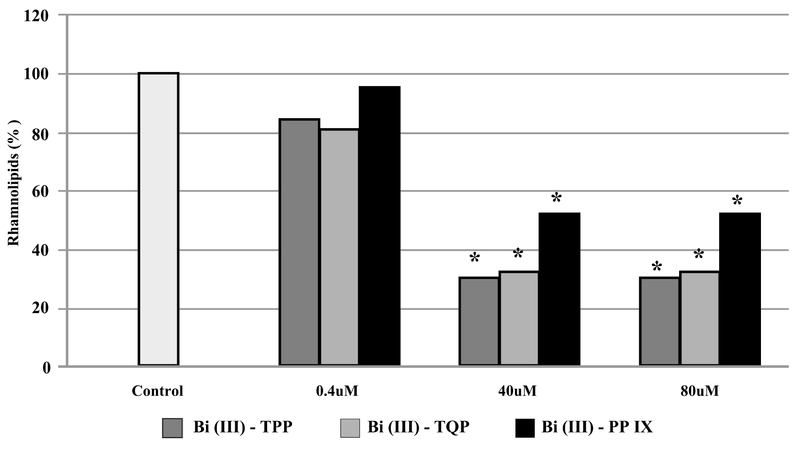 The inhibition of pyocyanin biosynthesis was in case of Ві(ІІІ)-ТPP for two times, and Ві(ІІІ)-ТQP and Ві(ІІІ)-PP IX – 32% and 25% respectively. Rhamnolipids production after pre-treatment with synthetic and natural porphyrins bismuth complexes also decreased (Fig. 2). The highest ability to inhibit the synthesis of these metabolites showed Ві(ІІІ)-ТPP and Ві(ІІІ)-ТQP. After pre-treatment of the P. aeruginosa PA01 cells with 0.4 μM of each compounds the rham­nolipids level in culture supernatant were the same and 80% of the control value. When 40 μM of these com­pounds were used, rhamnolipids level in the culture supernatant was 32% of the control value, and after pre-treatment with 80 μM – 20 and 23%, respectively. Lowest inhibitory capacity on the rhamnolipids biosyn­thesis showed Ві(ІІІ)-PP IX. Rhamnolipids value after pre-treatment with 0.4; 40 and 80 μM of this compound in overnight culture supernatant was 95, 42 and 52% of the control value, respectively. The study of the P. aeruginosa PA01 quorum sens­ing autoinducers biosynthesis after pre-treatment with synthetic and natural porphyrins bismuth complexes was conducted in a three time points – after 3, 6 and 24 hours of incubation. Obtained results showed (Table II–IV) that in the control there was a difference in appearance of autoinducers within the investigated time intervals. First the autoinducer, which appearedin the culture medium after three hours of incubation, was 3-oxo-dodecanoyl-homoserine lactone. Butiryl homoserine lactone appeared later and reached its maxi­mum concentration after 6 hours of incubation. At time equal to 24 hours from the start of incubation, the levels of homoserine lactones decreased. PQS was detected first time at time point equal 6 hours of incubation and reached its maximum concentration after 24 hours. Received data showed that after pre-treatment of P. aeruginosa PA01 cells with studied substances, autoinducers level in culture supernatant decreased (Tables II–IV). Autoinducers biosynthesis was more sensitive to Ві(ІІІ)-ТPP. Lowest ability to inhibit an autoinducers biosynthesis showed Ві(ІІІ)-PP IX. In the case of Ві(ІІІ)-ТQP, it was shown that its effects were smaller that the same effects of Ві(ІІІ)-ТPP, but they were still higher than Ві(ІІІ)-PP IX. It was shown that the synthetic porphyrins bismuth complexes pos­ses a higher activity to 3-oxo-С12-HSL and PQS bio­synthesis than to С4-HSL one. In contrast, Ві(ІІІ)-PP IX showed the same effect on the biosynthesis of all studied autoinducer. The results showed that the inhibitory effect of por­phyrins bismuth complexes on the biosynthesis of auto­inducer was dependent on the concentration of por­phyrin. After 6 hours of incubation, P. aeruginosa PA01 in culture supernatant that were pre-treated with 0.4 and 40 μM of Ві(ІІІ)-ТPP concentration of the 3-oxo-С12-HSL was in 2.8 and 4.1 times lower than in control respectively, and after pre-treatment with 80 μM, con­centration of this autoinducer in culture supernatant were practically no determinable. After pre-incubation with 0.4 and 40 μM Ві(ІІІ)-ТQP, 3-oxo-С12-HSL a first-detected after 3 hours of incubation, but its concentra­tion were lower than in control in 1.5 and 3.1 times, respectively. С4-HSL was not detected up to 6 hours of incuba­tion in all cases (with and without porphyrins pre-treatment). After 6 hours of incubation, concentration of this autoinducer were lower after Ві(ІІІ)-ТPP and Ві(ІІІ)-ТQP pre-treatment than in control in 1.8–3.4 and 1.35–2.9 times respectively. After 24 hours of incu­bation, С4-HSL concentration was lower in 2–3.3 and 1.1–2.3 times respectively, compared the control. PQS biosynthesis was completely suppressed dur­ing the first 6 hours of incubation after pre-treatment with 40 and 80 μM of Ві(ІІІ)-ТPP. After pre-treatment with Ві(ІІІ)-ТQP, PQS were detected in all cases, but its concentration was in 1.6–3.1 times lower than in the control respectively. After 24 hours of incubation PQS concentration in the pre-treated culture were in 1.8, 2.6 and 4.4 times lower respectively in the case of Ві(ІІІ)-ТPP, and 1.4, 2 and 3 times when Ві(ІІІ)-ТQP were used. Ві(ІІІ)-PP IX showed no significant effects on the biosynthesis of autoinducers. The highest level of auto­inducer biosynthesis inhibition was detected after pre-treatment with 80 μM of this complex – 32–46%. The fact that bacterial quorum sensing system I underlies bacterial pathogenicity, makes it a promis­ing target for novel antimicrobial drugs. Quorum sens­ing in P. aeruginosa controls the production of many virulence factors such as pyocyanin, rhamnolipids, HCN, toxin A, etc. Signaling molecules can also act as pathogenicity factors. It was shown that acyl-homoserin lactones can modulate immune response, induce the death of immune cells, and affect the level of proin­flammatory cytokines synthesis (Shiner et al., 2005). Our study showed that synthetic and natural porphy­rins bismuth complexes that were studied, could be effective inhibitors of P. aeruginosa quorum sensing system. Mechanisms of anti-quorum sensing action of porphyrines bismuth complexes can be linked to its ability block the synthesis of signal molecules. On the other hand, our previous results (Galkin and Ivanitsya, 2011) show that exogenous quorum sensing autoin­ducers can modify the anti-quorum sensing activity of these compounds. These data suggest that in some cases porphyrins bismuth complexes possibly can compete with autoinducers for binding to their receptors. The discovered ability to inhibit autoinducers biosynthesis and, as a consequence, block pathogenic factors expres­sion (such as pyocyanin and rhamnolipids) and bio­film formation (Galkin et al., 2010) make synthetic and natural porphyrins bismuth complexes very promising for future studies as a new class of antimicrobial drugs. This work was supported by research grants from Ministry of Education and Science of Ukraine. Bassler B.L. 2002. Small talk: cell-cell communication in bacteria. Cell. 109:421–424. Brown S.P., P.B. Sam and R.A. Johnstone. 2001. Cooperation in the dark: signalling and collective action in quorum-sensing bacteria. Proceedings of the Royal Society B: Biological Sciences 268:961–965. Candrasekaran E.V. and J.N. Bemiller. 1980. Constituent analyses of glycosamino-glycans, pp. 89–96. In: R.L. Whistler (ed.) Methods in carbohydrate chemistry. Academic Press, New York, Inc.
Deziel E., F. Lepine., S. Milot, J. He, M.N. Mindrinos, R.G. Tomp­kins and L.G. Rahme. 2004. Analysis of Pseudomonas aeruginosa 4-hydroxy-2-alkylquinolines (HAQs) reveals a role for 4-hydroxy-2-heptylquinoline in cell-to-cell communication. Proceedings of the National Academy of Sciences, USA. 101:1339–1344. Essar D.W., L. Eberly., A. Hadero and I.P. Crawford. 1990. Iden­tification and characterization of genes for a second anthranilate synthase in Pseudomonas aeruginosa: interchangeability of the two anthranilate synthases and evolutionary implications. Journal of Bacteriology 172:884–900. Galkin N.B., C.V. Vodzynskiy, G.M. Kirichenko and V.A. Ivanitsya.2010. The peculiarity of Pseudomonas aeruginosa ATCC 27853 biofilm formation at the dark or photoinduced action of bismuth-contaning porphyrins (in Ukrainian). Microbiology and Biotechnology 11: 51–60. Galkin M.B. and V.O. Ivanitsya. 2011. Antibiofilm activity of por­phyrines bismuth complexes in presence of Pseudomonas aeruginosa quorum sensing autoinducers. Sepsis 4:106–107. Guerra-Santos L., O. Kappeli and A. Fiechter. 1984. Pseudomonas aeruginosa biosurfactant production in continuous culture with glu­cose as carbon source. Applied and Environmental Microbiology 48:301–305. Ishkov Yu. V., Z.I. Zhilina and S.V. Vodzinskiy. 2000. Porphy­rines and there derevatives. XXI. Journal of Organic Chemistry 36:609–612. Kociolek M.G. 2009. Quorum-sensing inhibitors and biofilms. Anti-Infective Agents in Medicinal Chemistry 8:315–326. McKnight S.L., B.H. Iglewski and E.C. Pesci. 2000. The Pseudomonas quinolone signal regulates rhl quorum sensing in Pseudomonas aeruginosa. Journal of Bacteriology 182:2702–2708. Pearson J.P., L. Passadori, B.H. Iglewski and E.P. Greenberg. 1995. A second N-acylhomoserine lactone signal produced by Pseu­domonas aeruginosa. Microbiology 92:1490–1494. Shiner E.K., K.P. Rumbaugh and S.C. Williams. 2005. Interking­dom signaling: Deciphering the language of acyl-homoserine lac­tones. FEMS Microbiology Reviews 29:935–947. Somanathan R. and K.M. Smith. 1981. Synthesis of some 2-alkyl-4-quinolone and 2- alkyl-4-methoxyquinoline alkaloids. Journal of Heterocyclic Chemistry 18:1077–1079. Winzer K. and P. Williams. 2001. Quorum sensing and the regula­tion of virulence gene expression in pathogenic bacteria. Interna­tional Journal of Medical Microbiology 291:131–143.